Nabbing a Minnow - my favorite shot during a marvelous moment with this Green Heron. "You can't see me. I'm a leaf!" 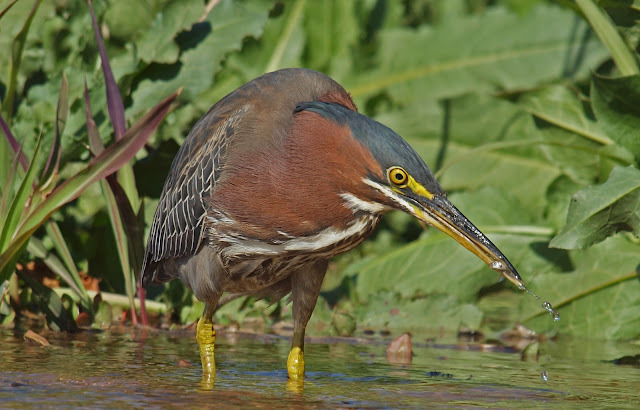 Much like a bittern, a Green Heron will at times hide in plain sight using its native camouflage and pretending it is a reed by pointing its bill skyward. Had I not been just feet away, just maybe it would have blended into the leaves it was mimicking. Below is a full profile view of this masterpiece of a bird! No matter how appetizing or not it may seem, no small pond critter is safe when this precision hunter is stalking the shallows. Here, I felt like the heron was boastfully showing me its catch. "I'm one bad killin' machine. And yes, I'm gonna eat this slimy worm and I'm gonna like it." We all know birds have ears, right? But we don't often get to see them. There was a steady breeze while I was taking these photographs and I got to see the Green Heron's ear hole a few times. Interesting, huh?! Yeah...I think birds look better with those ear holes covered with pretty feathers. Now, I'm not sure what that tongue lolling out the side of its bill was all about, but I'm not taking it as a personal insult. Check out that chiseled dagger-like bill. Awesome! Based on many photographs, it seems that most birds have built-in protective eye-wear called a "nicitating membrane". I captured this eye covering several times as the heron seemed to use it to occasionally blink. After all, the Latin "nictare" does mean "to blink". 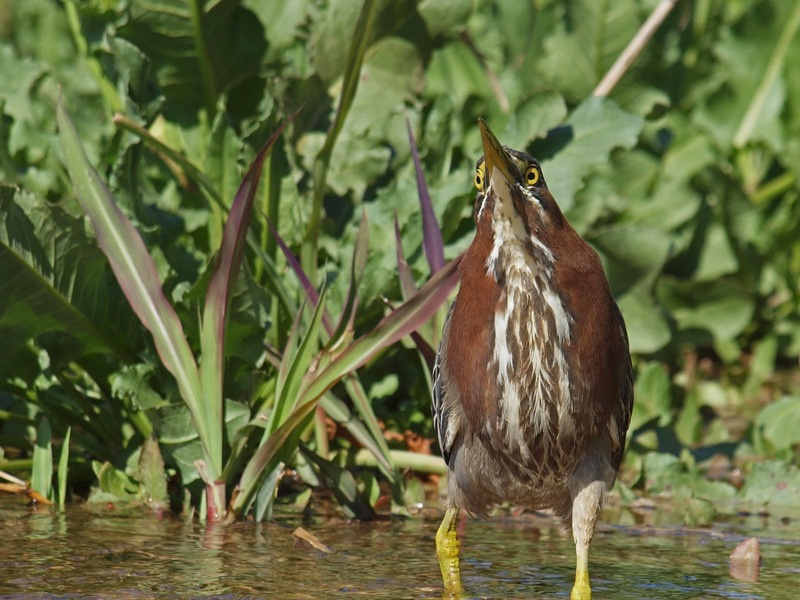 It was fascinating watching the Green Heron stalk and hunt. It seemed to move in slow motion, raising its foot out of water just a millimeter at a time. Friends and family to whom I've shown these images are consistently commenting about the lack of green as its name describes. I've seen some that appear more green than others, so there does seem to be a wide range of color variation. When I felt I had invaded this Green Heron's privacy long enough, I slithered back up the trail so as not to further disturb it. I had a human audience of three waiting for me back up on the trail. They said that they had seen me from across the pond and had come over to find out why in the world I was laying on the ground; either something was wrong with me or I was on to something very interesting. I showed them my photos on my camera and then guided them down the small little slope so they could see the Green Heron for themselves. They were delighted. The whole experience was one of those magical moments when all the elements combined in perfect harmony. I got an incredible up-close and personal experience, from which I learned, and I was able to get decent photographs. I hope you got a taste of it by reading this post. What wonderful photos of a great experience Robert!! These are some of the best Green Heron shots I've ever seen Robert, it really doesn't get any better. Not only do you have some great close-ups of some great feeding behavior, but your different shots showcase the birds many wonderful physical characteristics. Wonderful stuff, thanks for sharing. Robert, each post just makes me more jealous than the last! You are one dedicated birder and your perseverance and williness to get dirty paid off in spades! Great shots! I felt like I was down there crawling in the dirt with you! Those are some seriously quality shots Robert. You even got an ear in there! Good stuff. I've never seen a bird's ear before - how fascinating! Thanks for doing the leg (ground) work, and terrific photos! I can see elementary-age school kids thinking this would be a cool Power Point presentation - they would especially love the worm. Wow! What a fabulous experience for you! I have never seen photographs illustrating Green Heron behavior better than this! Truly outstanding! I am in awe! Great post and pix, Robert! I love the "greenies". They are so good at catching fish and their balance, as they lay out over the water while catching fish, is quite phenomenol! Awesome series of shots Robert! Herons are always so much fun to photograph. @Mia - It was a wonderful experience. As an amateur photographer, it was a dream scenario. Think of what I could have done with your talent, camera setting knowledge, experience, and equipment! @Rohrerbot - didn't realize you were in Tucson. We should have had you join us! @Laurence - Thanks! Very kind of you to say. @Kathie - I thought about you while we were birding around your old stompin' grounds. It would have been great to have you there. @OpposableChums - Thanks for the kind words! @Mel - Thanks. That ear was really fascinating. You actually gave me an idea for part of my presentation for the Great Salt Lake Bird Festival. I appreciate that! @Julie - Ah, shucks. You are so nice! @Jim - you prove that photographers do learn a lot about wildlife behavior. Thanks for your comment! @Rob - Thanks Rob. I'm looking forward to all of your warbler shots this spring! Robert, what an awesome experience. The photos are fantastic! I showed my students and they loved them! The ear hole shot was very cool to talk about with them. Excellent study, must have been great to watch the bird. Wow, my favorite heron. Awesome shots! Great photos! Love the captions and description! Such an encounter cannot be predicted. So often the heron flees before even being sighted. A wonderful series, Robert! Close encounter of the thrilling kind! Great shots. They are such elusive birds that chance encounters are always exciting. Wow!!! Once again, thank you for sharing this wonderful experience of a beautiful bird with us. @Jeremy - You shared this post with your students?! Ah man. That is awesome. You were a fantastic bird guide last weekend. @Alan - Thanks! By the way, I've been trying to add your birding blog to The Big List, but Blogger still has bugs and I have been having a hard time adding to my list for some reason. I'll get it on there as soon as its fixed though. @Eileen - for me, you and Corey Finger of 10,000 Birds! @Ken - Thanks Ken! They have been notoriously difficult to photography, so I was delighted when the perfect photography scenario worked out. @Ramblingwoods - I'd love to see young Green Herons. @Rachel - I hope some of the captions were interesting for fun. Glad you liked 'em. Fantastic images, Robert! These are some of the best I've seen you post, and some of the best Green Heron pictures I've seen. Wonderful!